At £700 a bottle, Vieille Bon Secours is quite the expensive adult beverage. While the beer is pretty steep in terms of cost, it is a 12-liter bottle and it is 8 percent alcohol by volume, which makes it 16 proof. 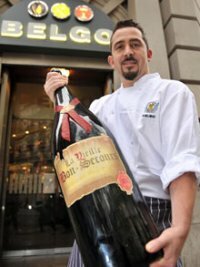 For a beer, that’s pretty strong, and since it’s in a huge bottle, you’ll definitely get your fill to drink should you pick up an $1158 bottle of ale. However, there is a more expensive beer available for those with a lot of money to spend. The special bottle of Lowenbrau Beer, last of a six pack dating from about 1937, is just a standard-sized bottle of beer, but it sold at auction recently for $8337. What’s so special about those undrinkably old brew? It’s the last known bottle of beer recovered from the site of the Hindenburg disaster. While we’ve covered more expensive liqueurs before at PopFi, this is the first time we’ve ever dealt with the upper echelon of the traditional working man’s drink. It just goes to show you that there’s always a market out there for something expensive, even if you only sell 3 bottles in 10 years. As a beer snob, I’d love to drink that Vielle Bon Secours; I’d try the Hindenburg Lowenbrau, but it’s probably rancid by now.